The German high-tech company TeAx technology, a leading edge drone system integrator with an international reputation, just did it again: Another proof of their excellence in designing and engineering of smallest and most lightweight solutions within the context of the commercial drone industry. “Offering clients with reliable thermal imaging technology for drones as one part of our business lanes, we typically provided them with solutions from the market leader Flir – especially since they came up with the Vue and VuePro”, Stefan Thamke, one of the CEO’s of TeAx Technology, says. “However, being one of Europe’s leading edge drone system integrators, we couldn’t withstand the challenge to create an even smaller solution on that”, Thamke carried on. The idea was born to create a solution on the smallest, commercially available thermal imaging camera for drone operations. After intensive research and development, the engineers from TeAx Technology were able to come up with a reliable solution – the product ThermalCapture MiniAV was successfully developed. ThermalCapture MiniAV is the choice of (commercial) drone operators when it comes down to size and weight. With only 5g (0,01lb), it is a full operational thermal camera providing analog video. The color video output is in PAL or NTSC. With an available framerate of 9Hz, a resolution of either 160×120 pixels or alternatively 80×60 pixels can be provided. To ensure optimal image quality, even a shutter is included. ThermalCapture MiniAV was also designed and developed to fully operate on its own: No additional PC or further embedded systems are needed to operate and use it. Only DC-power is needed to get operations going. A standalone operation was one of the goals, TeAx Technology defined for ThermalCapture MiniAV. To finally deliver the proof of concept, TeAx Technology quickly integrated the ThermalCapture MiniAV to a consumer drone and put it into operation. The result was the “World’s Smallest Commercial LWIR Thermal Drone” (youtube: https://youtu.be/ru0-UADMGXM). 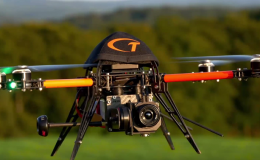 ThermalCapture is available for all drones, which can carry at least 5g. ThermalCapture MiniAV is now available and ready to order at TeAx Technology. It comes pre-configured to be used “out of the box”. For more advanced scenarios predefined color pallets can be adjusted or user-defined ones can be uploaded. Additional housing for the unit can be provided if it is needed. ThermalCapture MiniAV – Thermal Imaging Technology in a new scale. TeAx Technology provides application specific solutions in hardware and software. Expertise are embedded systems and remote sensing. The focus is on development and integration of special payloads for (commercial, professional) drones. For general development and projects on integration to PC software and embedded systems, TeAx Technology convinces through customized solutions and individual advice.